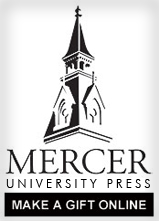 Established in 1979, Mercer University Press has published more than 1,400 books, releasing 35-40 titles annually. The mission of the press is to support the work of the University in achieving excellence and scholarly discipline in the fields of liberal learning, professional knowledge, and regional interest by making the results of scholarly investigation and literary excellence available to the worldwide community. Publishing authors from across the United States and abroad, the Press seeks and acquires manuscripts that contribute to the advancement of knowledge in the humanities with a focus on history, philosophy, religion, literature, and Southern culture.